I have a huge tomato plant growing in my garden. It's about the size of 3 to 4 regular tomato plants. Could it be a beefsteak tomato? 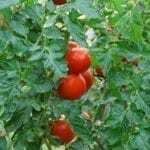 You most likely have an indeterminate tomato variety in your garden. These are plants that keep growing larger and larger throughout the season, as opposed to determinate plants, which grow to a certain size and then stop.